When we came across this incredible network communications resource from our pals at Contemporary Controls, we kind of thought we were dreaming. A 100+ page book all about BACnet, ModBus, ethernet, and an alphabet soup of digital protocols? And it’s available for free, just like that? Our staff at alpscontrols.com have been networking BAS pros for over two decades, and this still rocked their socks off. It’s big and beefy, and you simply won’t believe all the valuable information it’s got inside. Just click on the cover image on the left there and download it in all its PDF glory. Thanks a bunch, Contemporary Controls! 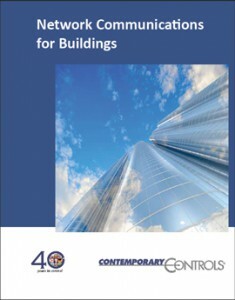 And if you’d like, you can browse Contemporary Controls products in the alpscontrols.com online marketplace right here.